While on a trip overseas last year, I watched a very interesting documentary on the rise and fall of California's San Francisco. That is, the rise of the techies and 'start up', and the very sad decline in affordability and subsequent living standards for the lower income earners. So it was with mixed expectations that I would visit the home of the Summer of Love this year. Personally, I haven't spoken to one person who has visited and not fallen in love with this 'city by the bay'. With its sunny days, wide open roads, good coffee, fresh air, beautiful bay and friendly people - not to mention to an ever-present sense of its rich history - I can understand why. That said, majority of these people have been there for work which makes them, in some way, part of this fortunate techie, start up culture. The Financial District, home to many of these businesses, buzzes with energy, prosperity and plenty of post-work happy hours for the suit or hipster-jean clad worker, before they evacuate for the evening or the weekend. In contrast, you also have a city that is going through a housing crisis, and the evidence is loud and clear. Homelessness is highly visible in San Francisco and it's clearly taking its mental and physical toll on those who have fallen victim to progress. My suggestion is to expect it, but not fear it or let it put you off. Travel cautiously, as always, but I implore you to offer compassion, dignity and care. The response you receive in appreciation for a bottle of water, some food or just a bit of conversation is overwhelming and indicative of the severity of their situation. On the topic of affordability, in what has become America's most expensive city, don't go to San Fran broke. Accommodation is not cheap, food is not cheap, the cable car is not cheap. But the experience is worth it. Here are some my favourite parts of four days spent in San Fran, along with a few tips. 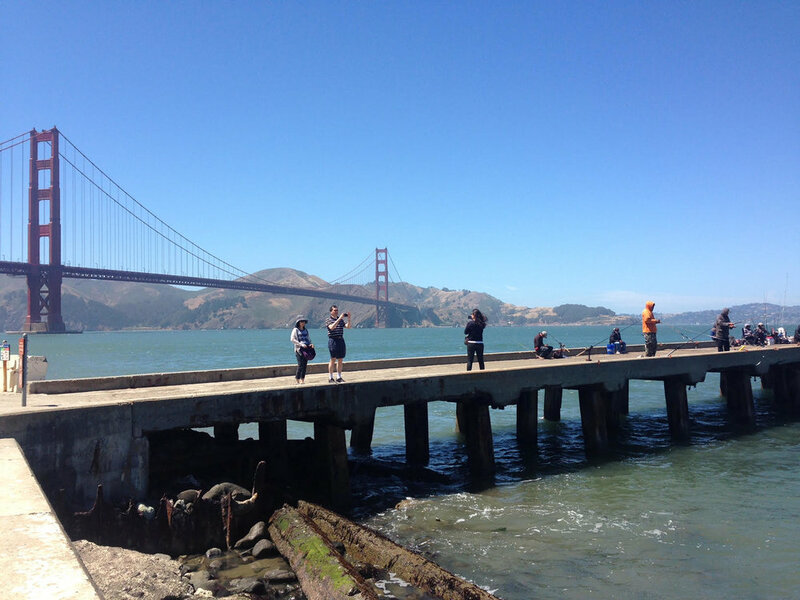 Head to the lively Fisherman's Wharf for some famous San Fran clam chowder and then work it off on a bike ride across the Golden Gate Bridge. There are a couple of bike hire places down by the wharf and they're much of a muchness. Pay attention to the directions at the start because if you go on a quiet day with few other cyclists around, it might be easy to get lost. It's best to go on a day that's not too windy, or to go around mid morning before the afternoon breeze kicks in. It's a beautiful ride, especially done slowly to take time out for the incredible views, and to take a few selfies of course. You can either cross the bridge and back over or you can continue on to discover the beautiful town of Sausalito, which became my next favourite feature. The unsuspecting home to some of San Fran's big wigs, Sausalito is a peaceful, gentle and pretty bay side town just a couple of large hills past the Golden Gate Bridge. If you've ridden over, there's a large bike rack available near the ferry for a fee, or you can find smaller standard (and free) bike racks around the town if you have a lock. The advantage of parking your bike close to the ferry is that once you've stopped into Lapperts for icecream, meandered through Princess Street boutiques like Klozet and Dynamic Energy Crystals, dropped into Venice Gourmet for some takeaway treats, and polished off the afternoon with bubbles on the water at The Trident (pic above), you can then simply hop onto a ferry, back to San Fran and return your treadly before another night ahead. There's something about traditional, old and clunky modes of transportation, like the rustic cable cars of San Fran - which conveniently also save you from the crazy, massive hills. There are three routes to take you to different parts of town and you can get tickets on board for USD$7 for a single use only ride. If you're hopping on and off, which I encourage you to do, this can really add up. Alternatively, there are one, three and seven day 'visitor passports' for USD$20, $31 and $40 respectively. You can't get these on board though so you need to pick up your passport from a retailer around town. Hold on tight - those hills are intense. What can I say; I'm a sucker for being near water. The Embarcadero area runs between the water front and road way of the Port of San Francisco and can either be a quieter destination or one filled with activity depending on the time of day. For a quieter, lazy experience, the day time is mostly filled with pedestrians, cyclists and street performers. Hit the area after 5pm, on the other hand, and you'll join the after work crowd letting their hair down at a number of the bars and restaurants along the area. With the sun out and the wind gone, I could sit there watching the water all day (with champagne, naturally). San Fran is similar to Melbourne; it's filled with amazing restaurants and bars for those who are willing to play find and seek. The Tipsy Pig is a good choice with strong cocktails, nice nibbles and a great beer garden. It's popular, so get in early to get a seat. A16 up the road is also one to check out with wonderful, Italian-inspired food in a buzzing environment (and Banksia flowers while we were there - a nice touch of home for the Aussies). If you manage to get your way into the secretive Bourbon and Branch, don't think you've conquered it all just yet; there are five secret bars all up on the one location. Good luck! With mixed expectations and a stubborn streak that would rear its ugly head every time I was insistently told how much I was going to love this place (travel is a very personal thing! ), I arrived with objective, albeit slightly skeptical, eyes wide open. But I'm glad I arrived at all. Safe to say everyone was right; I wanna get back to San Francisco. The character-filled boutique Hotel Zeppelin, near Union Square, has a great lounge for guests and the public to enjoy a coffee, wifi and a read by the fire for the cooler days.